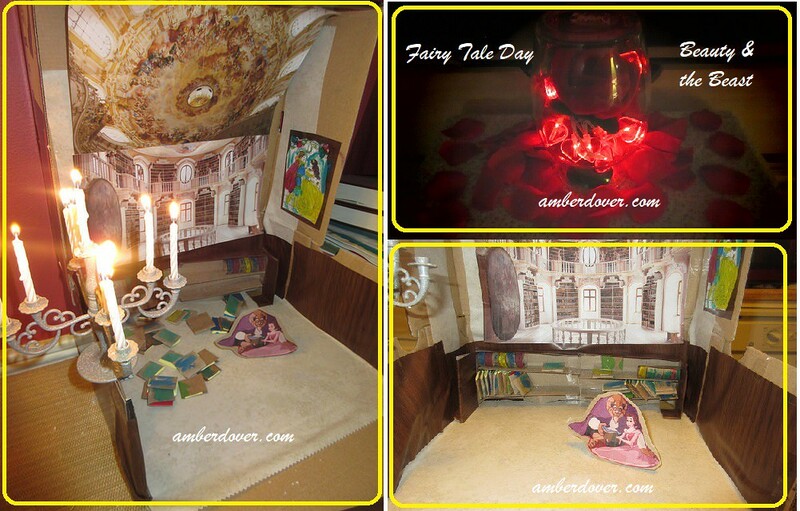 In this post: A Beauty and the Beast library diorama and the Beast’s rose! Hello, Dear Ones! Oh, it feels like forever. I’ve missed talking to you. It has been wild ever since Grandma’s funeral. I’ve been playing catch up with college and plus we’ve had sickness and other things creep up. I appreciate all of you for sticking with me. I have so many posts waiting for my attention. I’ve literally got a few years worth. I’m hoping to catch up more once school winds down. For now, I want to share a couple of beautiful crafts I did for fun. Yesterday was Fairy Tale Day. So I think these Beauty and the Beast crafts are fitting. The Beast’s Rose– This craft was super simple. I found the vase, the rose, and even the lights at Dollar Tree. I made this decoration for Ballet Day and Opera Day and kept it up for Valentine’s. It’s so romantic. I loved making this mini library! The books were fun to make too. I had a hard time keeping them on the cardboard shelves but it’s more natural to have the books scattered around Belle. She is an avid reader, after all! I used pictures of a German library for the background (found online and just for personal use). The books are made from cardboard and sticky notes that I stapled together. I used patterned contact paper for the floor and walls. I found the picture of Belle and Beast online and glued them to cardboard. I printed this mini coloring sheet and painted it to be a portrait on the wall. It looks similar to the Disney stained glass window of the couple. Leeland and I watched the Disney cartoon and this cute version shown below. It’s much shorter and less intense. I still love the Disney version the best though!